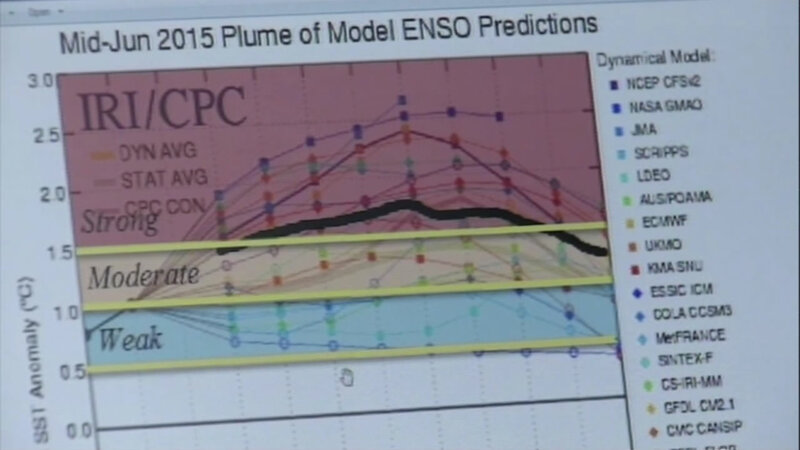 A new forecast by the National Weather Service shows a 90 percent chance of a historic El Niño system this winter. There is also an 85 percent chance of the system continuing into spring. A new forecast by the National Weather Service shows a 90 percent chance of a historic El Nino system coming this winter. There is also an 85 percent chance of the system continuing into spring. 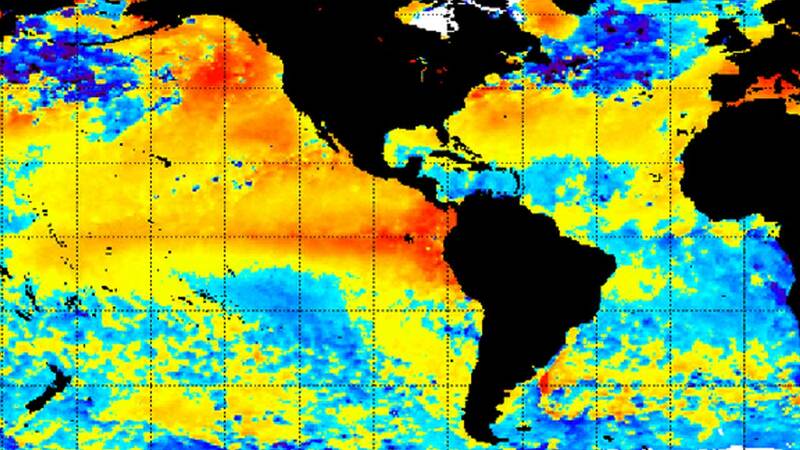 One NASA climatologist says this year's El Nino has the potential of being a "Godzilla." El Nino's can change weather patterns and often means heavier than normal winter rain. Satellites show the dramatic warming of equatorial Pacific waters and weakening of upper-level easterly winds, which indicate an ongoing and strengthening El Nino. The water at the equator is more than three degrees warmer then it was in 1997-1998, when the last El Nino struck. Wettest year in CA was 1.9 times greater than avg. To erase #cadrought we need 3 years at 2.5 timesrgreater than avg. While the system will bring relief to the drought, California officials believe it could stretch emergency resources thin. Officials say the state faces many challenges due to its elevation range, variety of topography and climates. Wildfires bring an added complication because they create debris for mudslides and landslides in heavy rain. But that's not to say this is an end to the drought. It's far from it. According to ABC7 News Meteorologist Mike Nicco California is in a record-breaking dry spell. "We would have to get two and a half times our average of rain over the next three years to wipe out the drought. Our largest amount of rain above average ever was 1.8 inches. So, we're trying to exceed levels we've never seen before and then we're trying to exceed them over three years to wipe out the drought?" he said. For all the complaints about California's drought, there is an occasional silver lining that Lisa Starrett knows all about it. "I would not say we have taken advantage. We have benefitted from it," Starnett said. Starrett works for first Impressions Synthetic Lawns out of San Ramon. Oneof their crews Thursdayt worked in Oakland where on Friday they will install 500 square feet of drought-beating synthetic grass. El Nino is not a concern. "Even if it does rain over this next season and we get some water don't see this slowing down," Lisa Starrett said. "We see this as the beginning." Locally, however, it could help. The East Bay Municipal Utility District says the magic number for next year in this region 50 inches. "Today we are in drought. Adn we know in the long term we will be in drought, so if you can make any long-term changes right now that is the best move," said Abby Figueroa of EBMUD. In a state where one square foot of grass uses 50 gallons per year, long-term solutions may also be artificial ones.